San Jose operates vintage trolleys over the downtown portion of its light rail system using an immaculately maintained fleet of four trolleys, which includes two San Jose natives. 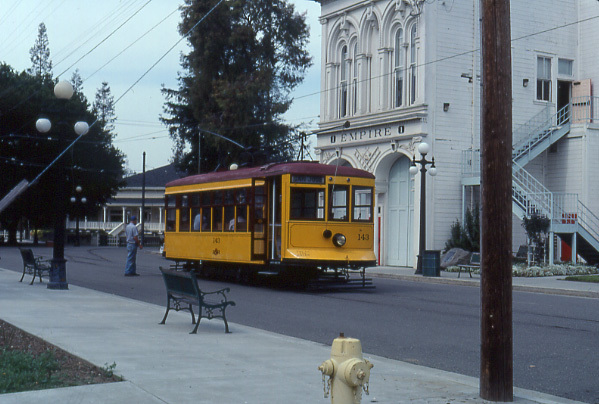 The native San Jose trolleys were painstakingly restored from carbodies found in use as homes in the local area. Rounding out the active roster are a car from Melbourne, Australia, and a Milan, Italy car converted by San Jose for double-end operation. The vintage cars are currently used daily from early April through early October. One car circulates through the route every 45 minutes, intermixed with LRV traffic. Regular VTA fares are charged on the historic trolleys (ticket machines at stations). The vintage cars are owned by a local non-profit organization which was formed in 1982 as the California Trolley Corporation, for the purpose of acquiring and restoring vintage trolley cars. The Santa Clara Transit District in turn leases completed trolley cars from the Trolley corporation at a nominal $1 per year. As a condition of the lease, the vintage cars are maintained by VTA at a dedicated shop that is part of the Light Rail Service Facility located at Younger St. In 1999, car 124 was removed from the vintage trolley lineup, and is now at nearby Kelley Park, where it remains in operation. 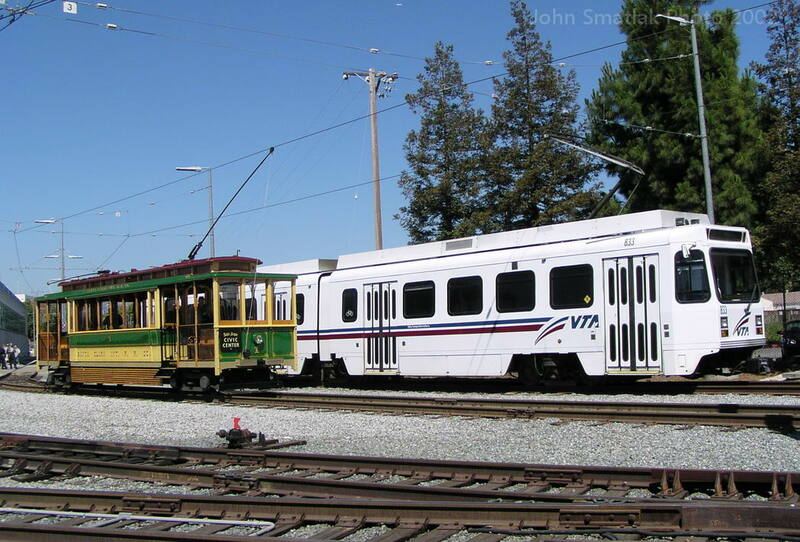 In 1999, SJTC also sold car 129 for $450,000 to Sacramento Regional Transit for use in special operations, as well as a possible future vintage trolley line. 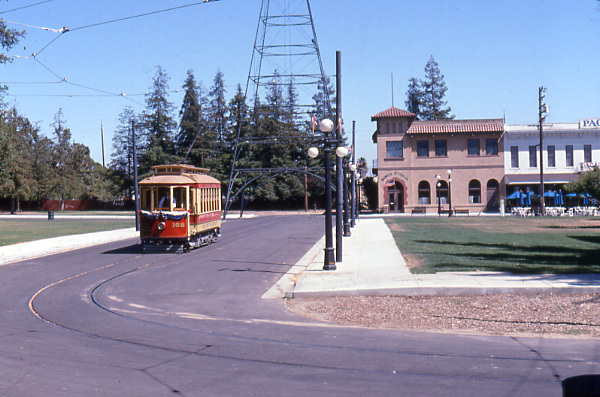 The story of San Jose’s vintage trolley operation is closely intertwined with that of the Kelley Park Trolley. 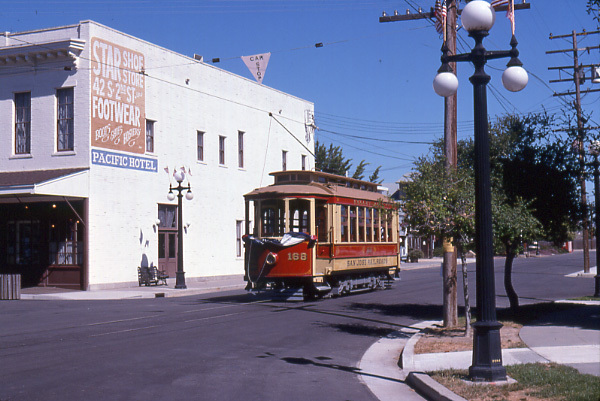 Located a mile southeast of downtown, the Kelley Park Trolley came into being as a result of the downtown vintage trolley project, with which it remains closely allied. That operation required a restoration facility and test track for the reconstruction and testing of cars, and the Kelley Park Trolley was created to fill this need. 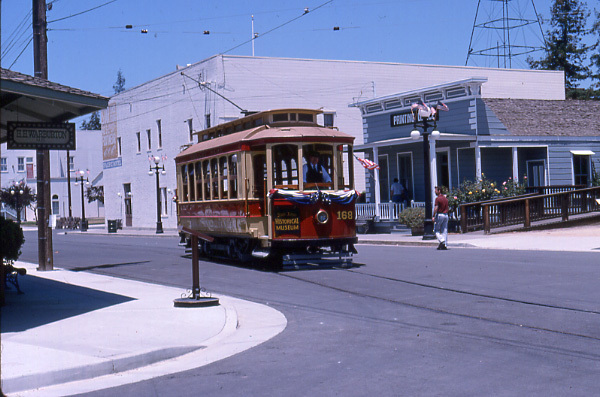 In 1994, the Kelley Park Trolley became part of the California Trolley & Railroad Corporation, a new non-profit which has combined the trolley with a local railway preservation group to form a comprehensive regional railway museum. The Kelley Park Trolley operates through the grounds of the remarkable San Jose Historical Museum in Kelley Park The park is open daily except Monday, and the Trolley Barn is open Thursday-Sunday. Kelley Park is a beautifully landscaped 14 acre site, recreating an historic town setting complete with paved streets lined with relocated and replica buildings. It provides a truly remarkable backdrop for the trolleys, and a visit is highly recommended! June 2003- San Jose hosted the 2003 APTA Rail Transit Conference in June, during which the APTA Heritage Trolley Task Force held a meeting. Conference participants were also able to enjoy rides on vintage car No. 1 which was in regular service for two days. Unfortunately, regular heritage trolley service on the VTA system has been suspended owing to budget constraints, and so this may prove to have been the only two days for heritage trolley operation in San Jose this season. No. 1 crossing Santa Clara on First St.
James station northbound, adjacent to St. James park. Melbourne W2 car undergoing heavy repairs. * Fridays, Christmas Eve, and New Years Eve: 6:30 p.m. to 10 p.m.
* Saturdays, Sundays, Christmas and New Years Day: 2:30 p.m. to 10 p.m.
August 2009- The California Trolley & Railroad Corporation opened a major new line extension to the Kelley Park trolley operation this month. The Happy Hollow extension runs for a about 3/4 mile, primarily along Sentner Blvd., allowing the trolleys to access the Happy Hollow Zoo and the Japanese Friendship Gardens. Congratulations to all at CTRC on this major milestone!